The following families have genealogy history eBooks on this page: Burley, Carteret & Bryant, Cushing, Davis, Farnham, Fenner, Hess, Kennan, Kirk, Morey, Sarchet, Sheldon, Stackpole, Walworth, and Wentworth. Welcome to Bookshelf 6 at Hawkeyes Trading Post! 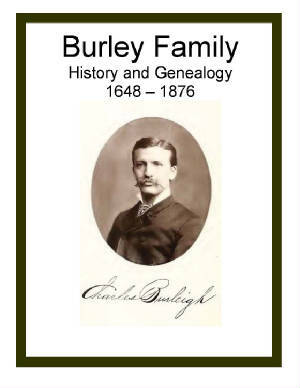 Burley Family History and Genealogy or The Genealogy of the Burley or Burleigh Family in America. PDF eBook English 9.97 MB. 1880. Very interesting short biographies are written on many of the 5 generations of descendants listed in this publication. Stretching from the year 1648 up to 1876 there are 27 pages of indexed names with over 1,000 people listed! 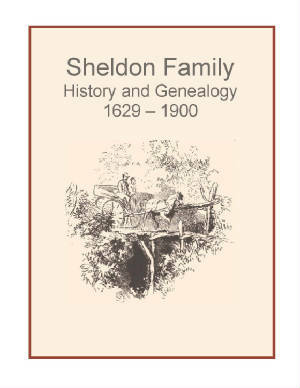 A valuable reference for family genealogists in the Burley or Burleigh families! Price $6.95 USD. 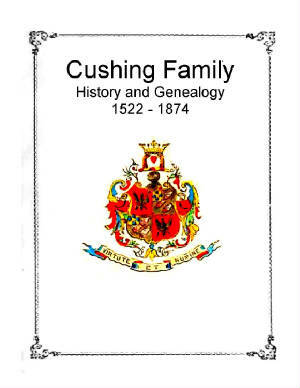 Cushing Family History and Genealogy or The Genealogy of the Cushing Family. PDF eBook English 8.30 MB. 1877. The legend of the family surname is detailed with it’s origin in the year 1466. An excellent reference with Cushing descendants compiled from 1522 up until the year 1874! There are 13 generations detailed with over 500 alphabetical names in a 12 page index. Price $6.95 USD. 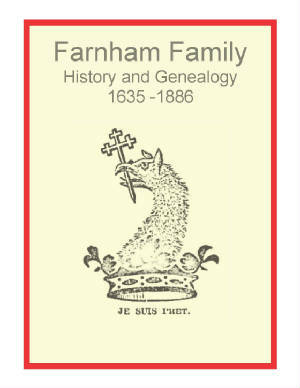 Farnham Family History and Genealogy or Genealogy of the Farnham Family. PDF eBook English 6.39 MB. 1888. Ralph Farnham set sail from England and in 58 days arrived in Boston, Massachusetts, on June 3rd of 1635. There are names, and many vital dates given for his descendants, which cover a period of over 250 years that stretches from 1635 to 1886. Also, there are many letters in this publication which opens the door to the time machine in bringing the past back to life! Price $6.95 USD. Hess Family History and Genealogy or Hess-Higbee Genealogy. PDF eBook English 9.43 MB. 1909. 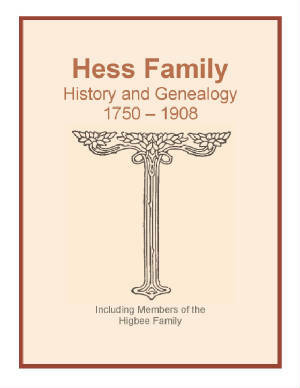 This is a fine reference which documents Hess ancestors from the year 1750 up to 1908. Poetry written by family members well over a hundred years ago shows the creativity of not just one, but several ancestors in the lineage. The Higbee family history begins documentation in 1560, and both families are included in the 13 page index of over 1,600 names! Price $6.95 USD. Kirk Family History and Genealogy or Historic Genealogy of the Kirk Family. PDF eBook English 11.4 MB. 1872. This genealogy begins with Roger Kirk in the year 1714 and lists short biographical sketches of his descendants. 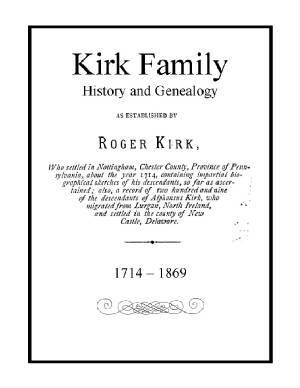 There are up to 8 generations of Kirk lineages, which stretch from 1714 to 1869, with over 1000 descendants and in-laws on 29 pages of indexed names. Fascinating biographies! Price $6.95 USD. Sheldon Family History and Genealogy or the Genealogy of the descendants of Joseph Sheldon of Suffield, Connecticut. PDF eBook English 2.55 MB. 1901. Painstakingly hand typed on an old Remington typewriter this publication was truly saved from the ravages of time! Over 270 years of compiled statistics for 9 generations of descendants, with family vital records for the years extending from 1629 to 1900. A delightful publication for the family genealogist with a wealth of kindred information! Price $6.95 USD. 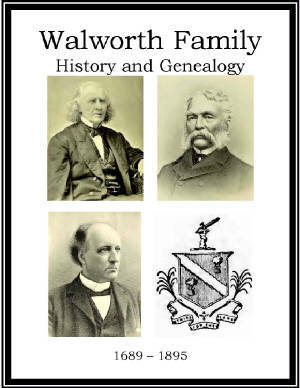 Walworth Family History and Genealogy. PDF eBook English 11.9 MB 1897. An excellent history of colonial times, and the Walworth’s part in the early American colonies. The War with the Native American Pequot Tribe, the Walworth division of land among the colonists, and the famed Pirate Captain Kidd’s relationship to the William Walworth homestead in Groton makes this family history come alive! Vital statistics of family kindred span the years from 1689 up to 1895, with 6 generations, and a 27 page index listing over 1,800 descendants and in-laws! 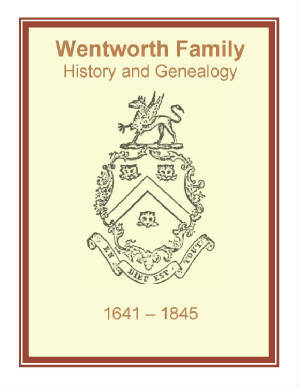 Anyone interested in Walworth genealogy anywhere in the world will find this eBook extraordinary! Price $6.95 USD. 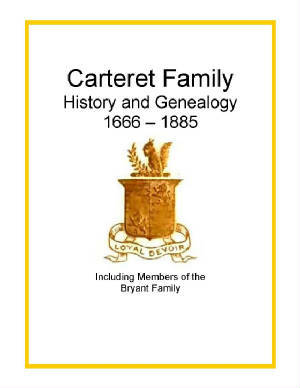 Carteret Bryant Family History and Genealogy. PDF eBook English 2.09 MB. 1887. Short biographies are abundant in this publication of compiled vital dates which extend from the year 1666 to 1885. Included is poetry written by family members, which brings to life the feelings of the writer. A delightful publication for the family genealogist with a wealth of kindred information! Price $6.95 USD. 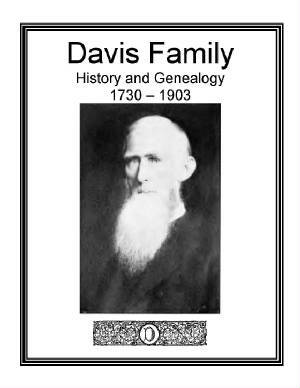 Davis Family History and Genealogy or A Genealogy of the Davis Family. PDF eBook English 6.69 MB. 1905. The amazing family tradition that Jonathan Davis at age 12 found his way aboard a “piratic trading vessel”, before a New York Merchant took him in, is recounted in this publication. There are 7 generations with an alphabetical index of over 750 descendants listed. In-laws from the Clark, Parks, Brokman, Dean, and Goss are also included. Price $6.95 USD. Fenner Family History and Genealogy or Genealogy of the Fenner Family. PDF eBook English 2.89 MB. 1887. 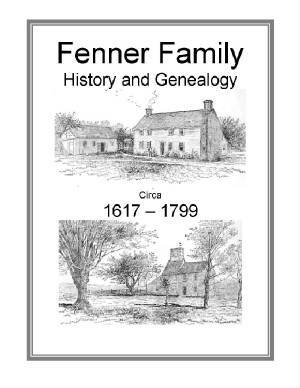 This publication provides numerous detailed biographies on Fenner ancestors for a period of about 182 years, from 1617 to 1799. There are 3 generations documented with vital dates for the given period along with information on adjacent in-law lineages. Price $6.95 USD. 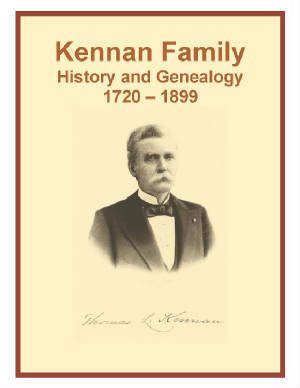 Kennan Family History and Genealogy or Genealogy of the Kennan Family. PDF eBook English 7.30 MB. 1907. Over 170 years are compiled into this excellent reference with detailed biographies on many Kennan descendants prior to 1900. Vital dates are given, which extend from 1720 to 1899, along with 12 pages of over 1000 alphabetically indexed names for this period! Price $6.95 USD. Morey Family History and Genealogy or A Genealogy of one Branch of the Morey Family. PDF eBook English 2.01 MB. 1890. 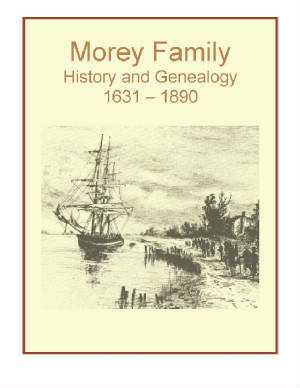 An excellent work with small biographies of Morey ancestors with compiled vital dates, and names, from the year 1631 up to 1890. An index of 4 pages containing over 160 descendants accompanies the 9 generations compiled in this publication. An excellent resource for the family genealogist! Price $6.95 USD. 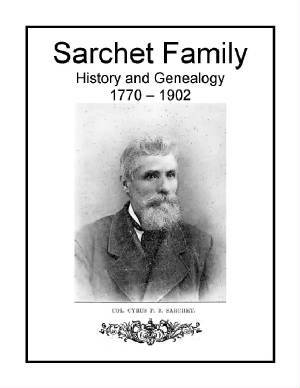 Sarchet Family History and Genealogy or The Genealogy of the Sarchet Family. PDF eBook English 1.01 MB. 1902. This is a short 13 page publication packed with information, which discusses the Sarchet family that fled mainland France due to religious prosecution. They found a home on the island of Guernsey, France. The family lore regarding the name prior to Guernsey is discussed. In 1806 John Sarchet crossed the North Atlantic to Cambridge, Ohio, and here is the descendant information stretching from 1770 to 1902. Price $6.95 USD. 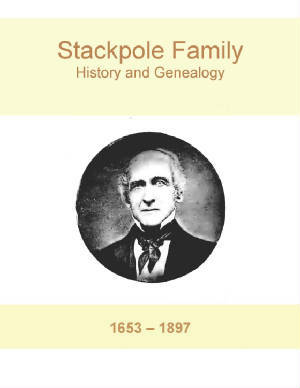 Stackpole Family History and Genealogy or History and Genealogy of the Stackpole Family. PDF eBook English 13.7 MB. 1899. A delightful family legend of the surname origin with roots to the year 1300, as well as the description of the hamlet of Stackpole in Wales, Britain is revealed in this publication. Many rare ancestral photographs are included with documentation stretching from 1653 to the year 1897. An excellent family reference! Price $6.95 USD.